The Mint™ Indicator Package enables traders to quickly and accurately gauge market internals — the forces that control price action and determine the intraday trend. The Mint Indicators allow you to see the true health of the equity markets by revealing the health of the TICK, VOLD (Volume-Differential), ADD (Advance/Decline), and VIX (Volatility Index). These are the symbols that many institutional traders monitor during each trading session to know when to enter and exit intraday positions. Too many traders continuously struggle to pinpoint when and where the tradable intra-day reversals are likely to occur... until now. The Mint Indicators do just that, by giving traders a look into the core of what controls the markets. The Mint Scalper™ is one of our favorite and most powerful indicators, which plots important trading signals from the TICK of any equity market (NYSE Tick, NASDAQ Composite Tick, NASDAQ 100 Tick, S&P 500 Tick, DJIA Tick, Russell 2000 Tick) directly onto a chart of another symbol! Using the Mint™ Scalper, we are consistently able to call the major turning points that occur during each trading day (cash session), in addition to knowing the exact minute in which buying or selling exhaustion is likely occurring. The reason we are able to do this is because the exact same TICK signals and setups occur during almost every single trading day! The Mint Scalper leads price like no other indicator because its signals are rooted in the NYSE TICK, which is the single best barometer of buying and selling pressure within the US equity markets. The TICK will almost always move up or down a few seconds before price reacts, allowing for the best possible trade entries and exits at points of buying/selling exhaustion. While we highly recommend using the Mint Scalper only with major Indices, ETFs or index-based futures, it can theoretically be used with any trading vehicle. The reason we stick to these specific trading instruments is because they have a very high correlation with the TICK, whereas an individual stock may or may not. Pink Dot ( LL ) = Lowest TICK reading of the day: this plots each time a new TICK low is made. Green Dot ( H ) = “Extreme” positive TICK reading: this plots when the TICK closes above the user-defined level. * Our default level for the NYSE TICK is +700. Red Dot ( L ) = “Extreme” negative TICK reading: this plots when the TICK closes below the user-defined level. * Our default level for the NYSE TICK is -700. * The reason we use a default setting of +-700 is because after extensive research, we have observed that the 700-750 level usually marks a temporary TICK high or low that immediately precedes a minor price reversal. The only days when this proves to be false is on a “train trend” day, which we define as a day in which the market internals are overwhelmingly bullish or bearish for the entire duration of the day — akin to a freight-train chugging along on a one-way course. “Train Trend” days are when new highs and new lows are continuously being set in the TICK, VOLD, ADD, and VIX — these are usually the days that move the market 2% or more in either direction. By using the other indicators included in our Mint™ Package, one can easily identify when a “train trend” day exists and can avoid falling into the trap of trying to “fade” immense buying or selling pressure. * We recommend using a setting of +-1000 if you recognize that it is a “train trend” day. The Mint Super Advance / Decline is an incredibly useful indicator that plots the relative advance / decline lines of the 7 Major Indices (NYSE, AMEX, S&P 500, DJ-30, NASDAQ-100, NASDAQ Composite, Russell 2000) on just one chart. Since the number of issues (stocks) within each index differs quite a bit, we have specially modified the calculations to provide a percent-based range from 100 to - 100. The difference between total advancing issues and total declining issues is reflected as a percentage of all the issues in each specific index. The key is to not be taking trades in the opposite direction of the general markets. While accurately gauging the intra-day direction of the market can be difficult and misleading; the Super Advance/Decline line provides a straight-forward approach to determining the intra-day trend of all the major markets. It enables traders to know whether the markets are exhibiting strength and only long trades should be taken or whether the markets are exhibiting weakness and only shorts should be taken. The Mint Line is a special moving average that is continuously smoothed in order to control the often erratic price action of market internals. By changing its color based on whether it’s sloping upwards or downwards, the Mint Line’s color-coded display enables traders to easily determine the trend of any market internal. The Mint Line has been specially designed to work alongside the Mint FIBs. Since the price action of the market internals can be so volatile, using the wrong indicators can result in an overwhelming amount of false signals. But when used correctly, the Mint Line and Mint FIBs provide traders with a clear-cut technique of how one can use the market internals to reveal the true inner workings of the major equity markets. The Mint FIBs are a modified version of our Fibozachi Inflection Bands™ (FIBs™). They have been specially formatted to work specifically with the Mint Line (read below) to enable traders to accurately gauge the current trend within any of the various market internals. The Mint FIBs are also intended to provide support and resistance levels for the Mint Line to help traders identify bullish and bearish breakouts. Since the data from the market internals is often erratic and unpredictable from one bar to the next, we have designed the Mint FIBs to work with the Mint Line in the same exact way that the normal FIBs work with price. Essentially, we are smoothing the chaotic market internal readings with the Mint Line and then using its position relative to the Mint FIBs to determine the current trend of the VOLD, ADD, VIX and TICK (or any other market internal symbol ). The Mint Oscillator is a special oscillator that is smoothed with several filters in order to adapt to the often erratic price action of the market internals. The Mint Oscillator color-coding changes depending on whether it is sloping upwards or downwards, in order to provide traders with a quick and easy identification of the current trend. By combining the Mint Oscillator with the Mint Line and Mint FIBs, one can accurately gauge the health of the market internals like never before! Users have the ability to fully customize the input settings ( Length, Smoothing ) to find their own perfect balance between response time and accuracy. We recommend the setting of 13 for the short-term trend, 34 for the intermediate-term trend, and 55 for the long-term trend. ** Our favorite setting is “55’, which makes the “Midline” an extremely important level that morphs between support and resistance. You will often notice the Mint Oscillator holding above or below the Midline for a large duration of each trading day … when this occurs, be sure to stay alert to the first crossover of the day, which often coincides with a major trend change in the market internals and the equity markets. The following picture illustrates how the Mint Line, Mint FIBs and Mint Oscillator work together to provide a clear visual profile of any market internal symbol, regardless of how erratic the data may be! The Mint Volume Profile indicators simplify volume analysis by comparing the volume of the current session against the average volume over any specified number of sessions. These indicators can be applied to any chart that is a volume-based symbol, such as the total volume of all NYSE issues ($TVOL) or the S&P 500 Up Volume, or the CBOE Total Put Volume. These are just a few examples ... any volume symbol can be used. The default length settings are set up to show how the current session's volume compares to yesterday's volume, the average 5-day volume and the average 13-day volume. The volume averages are displayed directly on the chart as colored lines, which allows traders to visualize and gauge the current sessions volume against the past day(s), week(s), or month(s). Experienced traders know how important it is to monitor whether price is moving on above-average volume or below-average volume. This allows traders to avoid the pitfalls of chasing a rally or selloff that is occurring on weak volume, while enabling them to capitalize on sessions where volume is significantly above its average and price is moving in a healthy fashion. The Mint Volume Profile II indicator is quite similar, however the volume averages are displayed in a sub-window below the chart as colored histograms, which allows traders to visualize and gauge the current sessions volume against the past day(s), week (s), or month(s). Each volume average is color-coded to allow for quick and easy identification. In the following example, the 1-day (yesterday) average volume is white, the 5-day average volume is aqua/cyan, and the 13-day average volume is blue. The right axis shows the volume differential between the current session and each volume average as a percentage, where vertical bars above the zeroline indicates that the current session's volume is greater than the average volume over "N" sessions ( and below the zeroline indicates that the current session's volume is less than the average volume over "N" sessions). Have a question about the MINT: Market Internals Indicator Package? Check out the MINT: Market Internals User Guide to learn more! I’m new to the world of market internals so you have no idea how much I appreciate how easy and informative the Mint workspaces have been in getting me caught up to speed. After using Mint for the last few weeks, I realize that if I’m going to stare at anything then market internals are what I need to watch. The workspaces you included are superb…thank you for sending me them. What makes these indicators so great is that they are thinking “outside the box.” The Mint Scalper signals keep coinciding with highs and lows on the ES. Most impressive! I’ve always heard that price follows volume or volume precedes price, except I’ve never really seen that when looking at my charts with normal indicators. I loaded up the Mint workspaces and have been watching them for the last three days -- now I can actually see the idea behind tracking volume and not just price! Very unique and innovative trading indicators, guys. The NYSE TICK is king in my book and it’s about time someone figured out useful indicators for the TICK and other internals. What are the best features of the Mint™ Indicators? The Mint™ Indicators are a highly specialized collection of Indicators that are a must-have for all intraday trader. We can confidently say that using the special MINT™ Indicators and workspaces is the most effective and accurate way of determining if the intraday trend is bullish or bearish. The reason is because only market internals can tell the full story behind each trading session, yet 99% of trading Indicators won’t work when applied to symbols like the NYSE TICK. You need to know which specific market internals to use and you need to have specialized Indicators, which is precisely what the Mint™ Indicator Package includes. 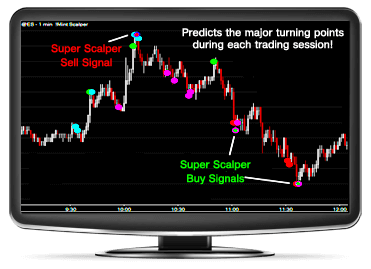 The most valuable Indicator is the Mint™ Scalper, which can be used on any TICK symbol to predict the major turning points of each trading session with incredible accuracy. The “Scalper Signals” are some of the most accurate and effective intraday reversal signals that we have ever developed and we personally rely on them during every single trading session. We strongly suggest using the Mint™ Indicators on a smaller timeframes such as 1, 2, 5, 10 or 15-minute charts. Since you are only tracking the internals over the course of a single session at a time, it helps to have more data to analyze and interpret. Using a large timeframe like 30 or 60-minute charts will only produce a handful of bars over the course of a single session and is less informative than the smaller timeframes. The default settings are what we personally use and serve as a good starting point for a wide range of trading styles. We encourage you to experiment with various combinations of input settings to determine which are best for your specific trading style. The Mint™ Indicators include optional alerts for a variety of different conditions and signals, such as "Extreme Tick" readings, "High and Low of Day TICK" readings, and the powerful "Scalper Signals". How can I use the Mint™ Indicators in my own strategies and codes? The Mint™ Indicators can be used in your own custom strategies and Indicators by purchasing the “Mint™ User Functions”, which are sold separately for $245 (half the cost of the Indicator Package). * You must own the Mint™ Indicator Package to use the Functions. What other Indicators do you recommend using in combination with Mint™? The Mint™ Indicator Package includes extremely unique and one-of-a-kind Indicators for diagnosing the internal health of the market, deciphering the intraday trend, and catching the major turning points during the session. This makes them work even better when paired with any of our other trend-based Indicator Packages — Vol.T™: Volume-Tick Indicators, Trend-Traffic™, Super MACD™, Super DMI™, Super Stochastics™, Super CCI™, and ZMA™.